Chief Justice of India K G Balakrishnan today expressed concern over the increase in the number of cases in the Supreme Court and assured to fasten the process of filling of the vacant posts of judges to overcome this. Unveiling the second phase of the police recruitment scam today, the Uttar Pradesh government terminated services of another 3,964 newly drafted constables. It also suspended six IPS officers, including one of DIG rank, for heading the boards that committed the “irregularities”. Union health minister Dr Anbhumani Ramadoss has once again dodged resident doctors of the All India Institute of Medical Sciences here by rescheduling the 35th convocation for October 23 instead of the previously agreed date of September 25. If you had a chance to meet 31-year-old bespectacled Liyakat Ali Khan, you would be floored by the suave and affable young “bureaucrat” and certainly consider him as a prospective groom for your daughter or sister. Soon after the recovery of half-burnt bodies of seven of the 10 suspected thieves, who had been beaten to death by a mob, from Hajipur, there was yet another allegation of laxity against the Bihar police. In what appeared to be a serious blow to Chief Minister Nitish Kumar, the National Human Rights Commission today has sought report from the Bihar government on the recent lynching incident in Vaishali arising out of instant street justice. The Manmohan Singh government is likely to decide within a fortnight on increasing the minimum support price of wheat and paddy, the production of which is estimated to exceed initial targets. Suspected Sangh Parivar activists tonight attacked the house of Selvi, daughter of Tamil Nadu Chief Minister M Karunanidhi, here tonight hurling a petrol bomb and stones protesting her father's remarks against Lord Ram. Union minister for science and technology Kapil Sibal today became the third union minister to comment on the Ram-Setu controversy by claiming that there was no scientific evidence of any man made bridge in the Palk Strait between India and Sri Lanka. The Congress may have succeeded in restraining its leaders from making statements on ministerial responsibility in the controversy over erroneous affidavit in the Sethusamudram project, but the party is yet to overcome the lingering effect of feud between some of its leaders. One of the two finalists in Sony Entertainment Television’s reality music show - Amit Paul has stolen hearts of millions in the region transcending the tribal- non-tribal divide. Former union minister and BJP MP Bacchi Singh Rawat is the next president of the Uttarakhand BJP unit replacing Bhagat Singh Koshiyari, an archrival of CM B.C. Khanduri, on completion of his term as the state unit chief. The change of guard is expected to consolidate Khanduri’s hold over the party set-up. The Indian government’s intervention has been sought for the creation of a cremation ground for Sikhs in Afghanistan following reports about the problems faced by them. Physicist and environmentalist Vandana Shiva will focus on the Bathinda and Mansa regions and periphery areas of Chandigarh in her contribution to Prince Charles movie on harmony, a film with which he wants to focus on harmony and creating a balance between nature and humanity. The police today arrested 12 employees of a shopping complex in Patna for attacking journalists. The incident took place yesterday when mediapersons rushed to the Vishal Mega Mart by the side of Times of India office near Dak Bunglow crossing after receiving news that a fire had broken out there. As the recent air-miss incident involving a special aircraft carrying UPA chairperson Sonia Gandhi and a Virgin Atlantic flight was being investigated, an air traffic control officer has been suspended, pending enquiry, official sources said today. In the wake of political developments in the Himalayan nation, the union home ministry today issued security alert to all five states along the Indo-Nepal border. India today expressed hope that all parties concerned in Kathmandu would implement previous understandings, which underpin Nepal’s peaceful transition. Prime Minister Manmohan Singh, who underwent a prostate surgery on Saturday, was discharged from the All-India Institute of Medical Sciences this evening. Home for kids with HIV/ AIDS. Sukinda one of the most polluted. Air pollution increases heart trouble. Fishermen go for cage farming. Konkona Sen Sharma is all set to score a hat-trick. In order to avoid any error in the reporting of court proceedings, particularly relating to legal intricacies, the Chief Justice of India today proposed to start a special training programme for journalists at the National Judicial Academy (NJA) at Bhopal to make them familiar with the basic requirements for this purpose. He said at least 30 to 35 journalists would be sent to the NJA and a request to the editors of newspapers and heads of electronic media would soon be sent by the Supreme Court Secretariat. The programme was more intended for journalists who make entry at a junior level and a news organisation could even suggest two names, the CJI said while informally interacting with journalists covering the apex court on the problems faced by them. The CJI said it was found that sometimes media go wrong on reporting of court cases and the apex court’s proceedings and the training would help to overcome this problem. “We will fix the time for the training in consultation with the NJA faculty… and the training will be imparted specially on the basics of the law, the precedents and contempt, required to be known by journalists,” he said. He said the NJA had been doing a commendable job in imparting training to judicial officers to firm up their knowledge of the law in the special training camps organised so far by it at Delhi, Kolkata, Ahmedabad, Chennai and Allahabad. The training camps had also firmed up the knowledge of judicial officers on resolution of cases through mediation, a concept widely followed in western countries. “Arrears is a problem,” the CJI said in an informal interaction with journalists from various news organisations coming to the apex court for covering its proceedings. He had invited the journalists to know the problems faced by them while covering the apex court proceedings on a day-to-day basis. The CJI said the four vacant posts of judges would be filled soon and steps would also be taken well in time to fill the six vacancies going to occur by November next year with the retirement of as many judges. 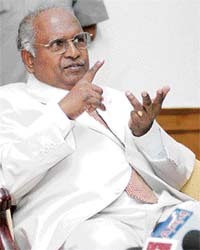 “Certainly they (vacancies) will be filled,” Justice Balakrishnan said. He, however, expressed ignorance about any move by the Centre to increase the retirement age of judges from 65 to 68 when asked whether the government has had any discussion with him on the issue. The CJI also said that a new security system would be in place on the Supreme Court premises requiring swapping of card to get entry. “It will be a high-security system and cards have to be issued for entry into the Supreme Court,” he said, adding that the system was being worked out and it would take some time to put it in place. The CJI also dispelled the wrong impression being created in some circles that the provision of Right to Information (RTI) would not apply to the Supreme Court. He said like any other institution, the Supreme Court also was covered under the RTI and if any person desired to seek any information under the Act, he would get it after filing a formal application required under the law. The CJI said the Supreme Court functioned in a transparent manner and its proceedings and orders were open to public domain. Departmental disciplinary action would be taken against another 45 additional SPs and DSPs who were members of the board. With the second phase of termination today, the total number of laid-off constables has reached 10,468, almost half of the 22,000 constables recruited in the civil police and Provincial Armed Constabulary (PAC) during the Mulayam Singh Yadav regime. Till now 18 IPS officers have been suspended and FIRs for criminal action initiated against them while departmental disciplinary action is being taken against roughly 100 other policemen. Addressing a press briefing, principal secretary (home) J.N. Chamber said while reports of another 18 recruitment boards had been received only 11 had been reviewed out of which all recruitments of 10 were totally annulled for gross irregularities. The recruits of one board, Saharanpur second recruitment of 2006, headed by DIG Prashant Kumar, has been spared from total cancellation. Here, only minor abnormalities like wrong totalling were found, which could have been due to human error, said the principal secretary. However, an adverse entry is being made in the annual confidential report of the chairperson of the board DIG Prashant Kumar. In all 11 boards, on which action was taken today, covered the districts of Morabadabd, Sitapur, Ghazipur, Etah, Gonda, Sonbhadra, Gorakhpur, Fatehpur, Etawah and Saharanpur. Of the total cancellation of new recruitments today, 3,664 belonged to the civil police while 300 were from the PAC. The IPS officers who have been suspended are DIG Ramendra Vikram Singh (IPS 1989), Dr Ashok Kumar (IPS’89), B.R. Meena (IPS’97), Mukesh Shukla (IPS ’92), Vijay Singh Meena (IPS 96) and Neelabhja Chaudhury (IPS 2000). The remaining four chairpersons, heading the boards, were suspended during the previous round and now only additional charges would be added to their chargesheets. They are S.K. Mathur (IPS ’90) who headed three boards, B.B. Bakshi (IPS ’90), Akhilesh Mehrotra (IPS ’88) and Daljeet Singh Chaudhury (IPS ’90) who all headed two boards each. According to the principal secretary, the central government till now not responded to the letter of recommendation for suspending two officers at present on central deputation. They are Daljeet Singh Chaudhury, private secretary to union home minister Shriprakash Jaiswal, and Mukul Goel, DIG, ITBP. The change in the minister's decision means that 634 of the 700 resident doctors, nurses and Ph.D will have to wait another month to get their hard earned degrees. So far, only 66 students, who needed degrees urgently, have received them following Delhi High Court directions to the health minister to sign their certificates within 24 hours. When Ramadoss refused to sign the degrees and created a fuss over the signatures of the Acting Registrar, Dr Sandeep Aggarwal, the AIIMS Staff Council resolved that the degrees would be signed by the Director and the Dean and issued to the students. The BJP had sought the Prime Minister's intervention in the matter. But then, Khan, who is already married and has a child, landed himself in the police net when he could not control his greed and took Rs 50,000 from one Vivekanandan of Erode in western Tamil Nadu promising him an engineering seat for his son. That, too, during a meeting when he had gone to Vivekanandan’s residence posing as Sudhakar with a marriage proposal for his niece. Khan’s modus operandi was unique. He had three aliases and signed up with one of the most popular matrimony websites in the country. While in one he posed as a sub-collector, the first posting an IAS officer in Tamil Nadu usually gets, an IAS trainee at the IAS Academy in Mussoorie or as a software engineer in the United Kingdom. Despite his marriage to Kshatriya Shabana of Neyveli in Tamil Nadu through whom he had a child, Khan succeeded in marrying three more “very successful women who gave up their careers”. Though he never appeared for the Civil Services examination or went to any engineering college to study computers, he succeeded in duping at least 37 women all over the country and even as far as Delhi and Nagpur till he landed in the net of Chennai City Police, which has a cyber crime cell. Posing as either Sandeep Kumar or Rakesh Kumar or Sudhakar, he allured and even “sexually exploited” at least 37 women some of whom were doctors, bank executives or software professionals who not only gave him their passports but also lakhs of rupees. Joint Commissioner of Chennai City Police said it was a case of online cheating through chatting and most of the women were innocent victims who fell prey to his unique methods. According to cell phone records being examined by the police, the number of women Khan duped and had physical relations with might be more than 100 all over the country. The police said the popular website could not absolve itself of its responsibility as the unsuspecting victims fell easy prey because of the fame of the matrimony portal whose headquarters were here but had portals for 15 communities in India ranging from Punjabi to Gujarati, Marathi, Assamese, Bengali and even Parsi and Urdu- speaking people. However, the police is baffled that how could Khan carry on his operations unchecked for two long years since he had been arrested before that in Trichy for making pornographic films in a cyber café which he owned. On Sunday, Chief Minister Nitish transferred district magistrate of Vaishali Lalan Singh and SP Anupama Nilekar and suspended two other officials for their negligence in properly disposing the bodies. The government was embarrassed after the half-burnt bodies of the thieves were recovered by the local people from Ganga in Hajipur. Now, reports emanating from the team, representing national commission for tribes men, claimed that the police did not even bother to take the fingerprints of the 10 thieves before their bodies were disposed off. Reanke said the commission was told by the local police that the fingerprints of the alleged thieves were not taken by the forensic experts before their bodies were disposed off. The commission thus wondered how the CID inquiry could be fruitful to prove a link between them and the alleged theft that caused their death if the local police did not take their fingerprints. Members of the commission had visited Dhelpurwa, the village where the incident took place, Hajipur, headquarters of Vaishali district, and Patna for a probe in the past two days. Meanwhile, the horror-struck nomads already demanded a CBI probe into the incident. They have also questioned the silence of human rights bodies. The victims were Kueris, a sub-group of the backward nomadic tribe called Nat. State president of the Akhil Bharatiya Nat Vikash Sangh Lal Babu Kafila said the organisation had no faith in the Bihar police and the state administration. “The truth will never come out if a state agency is given the task of carrying out a probe”, he alleged. The Bihar government has asked for a CID probe into the incident. On his part, Nitish Kumar assured that the CID would also try to find out the veracity of the report that all 10 victims came at the village for a feast and a cultural programme and not for burglary. In what appeared to be a serious blow to Chief Minister Nitish Kumar, the National Human Rights Commission (NHRC) today has sought report from the Bihar government on the recent lynching incident in Vaishali arising out of instant street justice. What could have embarrassed the Nitish government more was that the pulling up by the NHRC came close on the heels of yet another shocking incident of vigilant justice today. Rakesh Kumar (26) was beaten to death by villagers at Patahi village of Sitamarhi district, about 200 km from here. Villagers suspected him of stealing a statue from a local temple. The NHRC reportedly has sent the notice today to the DGP, Bihar and SP, Vaishali, on the lynching of 10 suspected thieves by a mob in the district. The proposed MSPs for paddy, wheat and other crops will be sent to the Cabinet by this month-end, agriculture secretary P. K. Mishra told reporters on the sidelines of the two-day “rabi campaign” that began here today. He said the ministry had received the recommendations of the Commission for Agricultural Costs and Prices (CACP) and a note would be sent to the Cabinet soon. Currently, the MSP for paddy is Rs 580 a quintal for common variety and Rs 610 for “A” grade while for wheat it is Rs 750 per quintal (excluding bonus of Rs 100). He also said the prospect of kharif crops was good and production was likely to cross the tentative target for many crops. We expected the kharif output to cross the target as rainfall was good. As per the initial targets, total foodgrain production would be 221.5 million tons in 2007-08, of which rice would be 80 million tons in kharif and 13 million tons in Rabi. The agriculture ministry was expecting a record foodgrain output in 2007-08, he said. Foodgrain output was 216.13 million tons in 2006-07, according to fourth advance estimate. This (current year) is one of the best kharif seasons in recent times as distribution of rainfall, geographically and in terms of number of spells, is very good, Mishra said. He expressed confidence that there would be no fall in rice production, which was the major foodgrain of kharif. The centre is yet to finalise the crop production target for the current year, which may be done after holding discussions with states in the Rabi seminar. Mishra complimented the farming community for realising newer landmarks in production performance during 2006-07. The rabi foodgrain production of 105.6 million tonne surpassed the previous record production of 104.2 million tonne achieved in 1999-2000 as well as the target set for 2006-07, he pointed out. However, there is little room for complacency on these achievements, as the production level has not been maintaining the pace with demand, particularly in respect of oilseeds and pulses causing substantial import dependence. He added that the stimulation of agricultural growth would necessitate special efforts for reversing the trend of growth deceleration with short-term to medium and long-term perspective to achieve the targeted 4.1 per cent annual growth rate during the 11th Five Year Plan. A Tamil Nadu government bus bound for Bangalore was set on fire at Bommanahalli, about 35km from here, police said. A 50-member strong group, shouting slogans against CM for his remarks on Lord Ram and Ram Setu, hurled a bomb and stones and damaged window panes of the house, police said. Selvi and her husband Selvam, who is heading the SUN TV group's Kannada Channel, Udaya TV here, were in Chennai when the incident took place, they said. Two security personnel guarding the house were injured in the attack. The minister, when questioned on this score here, however, said an individual’s faith in Lord Ram should be respected. When questioned whether he believed Ram was associated with the Ram Setu he said “personally I believe in Ram but there is no evidence that the Ram Setu structure was man made”. Sibal said he was speaking about the issue only because he was the science and technology minister. He, however, refused to comment on a question whether Ambika Soni should resign. The minister, however, maintained that the Indo-US nuclear deal would not have any impact on the multi-billion dollar Iran gas pipeline. He also clearly stated that India was in favour of the deal. “There is no question of giving up on the deal”, he said. When asked about the prolonged discussions with Iran and the fact that Iran had warned that it would finalise the deal with Pakistan, he said negotiations were still on track with Iran. The 2,600 km-long pipeline is expected to cost $ 7.4 billion and according to Iranian projection could be completed by 2010 Sibal also defended the nuclear deal and its related 123 agreement, by saying the visit of Atomic Commission Chief Anil Kakodkar to Vienna amply demonstrated the UPA government’s commitment to the deal. He said the deal was necessary for the country at a time when it wanted to sustain its eight to nine per cent growth rate. “Nuclear energy would be critical to meet the energy needs in such a situation”, he added. The minister also made it clear that the UPA government had pursued the nuclear cooperation initiative taken by the earlier NDA government. He said the country would continue having the right to weaponise as well as continue with its uranium enrichment programme. Sibal came down heavily on the Left parties, saying they must spell their misgivings clearly. “The people of the country have the right to know whether the Left is opposing the nuclear deal purely because of its anti-US stance. By clinching nuclear deal UPA government and Prime Minister Manmohan Singh has not violated the mutually agreed Common Minimum Programme with Left parties. We have not violated any coalition dharma" he added. Culture Minister Ambika Soni, who was apparently miffed over public statements made by some of her party colleagues on the affidavit mess up, has sought an appointment with Prime Minister Manmohan Singh, who returned home today after a surgery at AIIMS. The union minister, who clarified her position to Congress president Sonia Gandhi on Saturday last after her return from a visit abroad, has already submitted all documents, including her notings to the PMO. Soni has said one of the three deletions marked by her in the affidavit had not been carried out. Though minister of state for commerce Jairam Ramesh later apologised to Soni for his remarks that suggested she should have resigned, the matter does not seem to be over yet. Sources said Soni was upset with Ramesh despite his apology. Party leaders Digvijay Singh and Salman Khursheed had disagreed with Jairam Ramesh while R.K Dhawan found none of the two ministers exemplary in their actions following the affidavit controversy. Sources said Ramesh had also clarified his position to the Congress president. They said during her meeting with the Prime Minister, Soni is likely to touch on the remarks of her ministerial colleague which are seen by many in the party as a breach of the collective responsibility of Cabinet. The affidavit controversy has also split the opinion in the UPA with allies like the RJD supporting the stand of the government in withdrawing the affidavit. Rural development minister Raghuvansh Prasad Singh today said it was inappropriate to question Lord Ram's existence. The majority Khasi and Jaintia tribe residents in Shillong, called the music capital in North East, have apparently forgotten their age-old differences with the minority non-tribal communities while going all out in support of their Bengali idol, Amit Paul, a high school drop-out who has been nurturing a dream to make a big splash in Indian music scene. Coming close to realisation of his long-cherished dream, Amit is today enjoying support of all and sundry in his home state irrespective of caste, creed, religion and age groups giving enough reason for the state chief minister D.D Lapang to recognise him as the “Ambassador of Peace” in Meghalaya during his recent visit to the state capital. “The tribal populace in the sleepy hill state who are used to going to bed in early hours of the night, remain glued to their television sets on Friday and Saturday nights to cheer their idol in the Sony Television reality show,” said Teresa Lyngdoh, a resident. “It has been great to see thousands of tribal residents of Shillong from all age-groups taking out procession in the city displaying placards seeking vote for Amit Paul, a Bangali. Music has the unique quality of bridging divides between communities and wining hearts of all,” said Sandip Chaudhury, another resident. The picturesque hill city, a tourist hot spot in the North East, is splashed with posters and cut-outs of the Indian Idol finalist. Teenagers are often spotted travelling in those yellow-black taxis carrying posters of Amit afloat in their hands. “On the day Amit came to visit Shillong to seek votes, the crowd was so big that the police were sent on a tizzy to protect the idol. Music, you know, is the heart of Shillong,” said Liza Sangma, a college student. Spokesperson for the BJP Davinder Bhasin said formal announcement of Rawat’s election would be made tomorrow at the state BJP office. No other nomination was filed for the post. Though former state health minister Ajay Bhatt, a close aide of Koshiyari, was also said to be in the fray, he decided against filing nomination. After emphatic victory in the Dhumakot Assembly bypoll, this is considered to be another major political victory for Khanduri due to exit of Koshiyari, considered parallel centre of power in the state. A protégé of senior BJP leader Murli Manohar Joshi, Rawat was expected to make it to the top even in the case of more than one nomination. In a letter to external affairs minister Pranab Mukherjee, Rajya Sabha MP Tarlochan Singh today sought the intervention of the Indian government to impress upon the government in Kabul to respect the age-old religious rites of Sikhs by allotting some ground near the gurdwaras. The Rajya Sabha MP was reacting to reports, which highlighted the problems faced by the Sikhs in cremating a body and the protest they held outside the UN headquarters in Kabul to give vent to their anger. Tarlochan Singh pointed out that he had raised the issue with the Indian embassy there during his recent visit but no action seems to have been taken in this regard. He said the Sikhs had been taking the bodies to distant places, including Peshawar in Pakistan, for cremation. However, the Sikhs who are now living there are poor and cannot afford to airlift the bodies to India. The MP pointed out that the prevailing security situation in Afghanistan prohibited Sikhs from travelling to distant places for cremation. In the letter, he pointed out that the Sikhs also needed facility of funeral vans, which the Indian embassy should provide out of the grants given for Afghanistan. Talking to The Tribune following her return from the UK, where she held discussions with Prince Charles regarding the film, Shiva said her part included providing inputs on the agriculture section. The filming will take place in the Bathinda and Mansa regions and focus on soil problems, water logging and suicides by farmers. Another aspect that the film would also touch upon is the burgeoning luxury housing on agricultural lands around Chandigarh. There would be a lot about India. In the agriculture part, they would concentrate on western parts of Punjab because of soil problems the state was facing after the agricultural revolution, water-logging and salination…and Chandigarh to highlight the grabbing of farmers’ land for luxury housing, she said. Several farmers had approached her, alleging that developers were forcefully grabbing their land. The film is tentatively termed The Harmony Project and Prince Charles is said to be in advanced negotiations with Hollywood producers. Shiva, terming the project a very good concept, said society had stopped talking of humanity. “Society doesn’t talk of humanity, just economy and money,” she said. The police today arrested 12 employees of a shopping complex in Patna for attacking journalists. The incident took place yesterday when mediapersons rushed to the Vishal Mega Mart by the side of Times of India office near Dak Bunglow crossing after receiving news that a fire had broken out there. Several journalists, including an ETV reporter, Aaj Tak cameraman and a local reporter of a Hindi daily, were injured in the attack. The agitating journalists, who staged a sit-in demonstration today, alleged that the manager of the mart prevented them from entering the complex and ordered his employees to drive them out. The shopping complex employees, armed with hockey sticks and canes, assaulted them. Maintaining that the incident was not one which could have resulted in a mishap, chief of directorate-general of civil aviation (DGCA) Kanu Gohain told reporters that “no unsafe situation was created” and both the planes were under constant radar surveillance and VHF (very high frequency) radar contact. He said the incident was a “procedural breach” of regulations laid down for lateral and vertical separation between two aircraft flying at a certain height. This led to what is called an “air-miss” as opposed to “near-miss”. The border-guarding force on the Indo-Nepal border, Sashastra Seema Bal (SSBI), has been asked to maintain strict vigil all along the 1500-km porous border, a statement from the ministry said. It said the SSB had been asked to check any movement of criminals and flow of arms. Uttarakhand, Uttar Pradesh, Bihar, West Bengal and Sikkim governments have been told to remain vigilant, it added. In response to a question on development in Nepal, external affairs minister Pranab Mukherjee said though these were internal issues of Nepal, which had to be resolved by Kathmandu itself, “we would hope that all concerned will implement previous understandings that underpin Nepal’s peaceful transition, and that differences will be resolved democratically”. Prime Minister Manmohan Singh, who underwent a prostate surgery on Saturday, was discharged from the All-India Institute of Medical Sciences (AIIMS) this evening.